Success story: Maritime alumna leads Beaver Island Boat Co.
By the calendar, spring arrived two weeks ago, but for Great Lakes Maritime Academy alumna Margo Marks, it sailed in today. 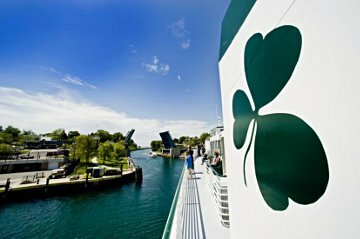 This morning the Emerald Isle picked up passengers at Charlevoix for the Beaver Island Boat Co.’s first voyage of the season. For company president Marks, the vessel’s return from its winter on the Lake Michigan island truly signifies spring. Marks, 54, and her husband Todd both graduated in 1983, she as a deck officer and he as an engine officer. Their timing couldn’t have been worse, coinciding with a slump in the U.S. steel industry that dominated Great Lakes shipping. In order to find work, Todd Marks joined the Army and the couple left the state for nearly a decade. But the Great Lakes are a powerful lure. “We were always trying to find a way to get back to Traverse City,” Marks said. In 1994 Marks got her own second shot at a maritime career when she became harbormaster for the village of Elk Rapids. She stayed in that role until 2001 when she joined the Beaver Island Boat Co. as general manager. The ferry is considered a lifeline for the island’s 550 resident and a boon for tourism in Charlevoix. During the course of 375 annual round trips between April and December the Emerald Isle transports 6,500 vehicles, 40,000 passengers, and all manner of freight, from appliances to manufactured homes to heavy equipment. “One time we had a young lady take a goat in her car,” Marks recalled. Charlevoix Convention and Visitors Bureau Executive Director Amanda Wilkin noted that 40,000 ferry passengers also means 40,000 potential diners and shoppers are discharged into the streets of Charlevoix. The drawbridge itself is an attraction. Marks also serves her industry as the president of the Passenger Vessel Association, a national association representing owners and operators of dinner cruise vessels, sightseeing and excursion vessels, car and passenger ferries and other vessels that carry more than 200 million passengers per year. 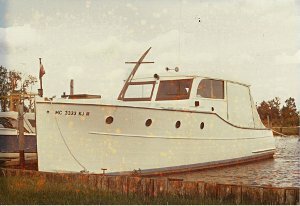 Marks traces her maritime career to her downstate childhood, when she helped her father restore a 1927 wooden-hulled boat at a marina in Monroe (right). “It fell over in winter storage. My dad bought it with a hole and we repaired it,” she said. They subsequently spent every summer weekend on the Queen Ann — named for her mother — on Lake Erie. “Dad and I would go out and do a lot of perch fishing. We’d go out and fish and swim and it was a great time,” Marks said. A photo of the Queen Ann now graces her office as Marks prepares for another season helping other families make memories on another Great Lake.